FROST YOURSELF THIS SUMMER WITH A REPLICA TIM HORTONS CHILL MADE WITH PEACHES AND CREAM. Frozen drinks during the summer months are a must especially for Canadians who bask in hot humid temperatures. 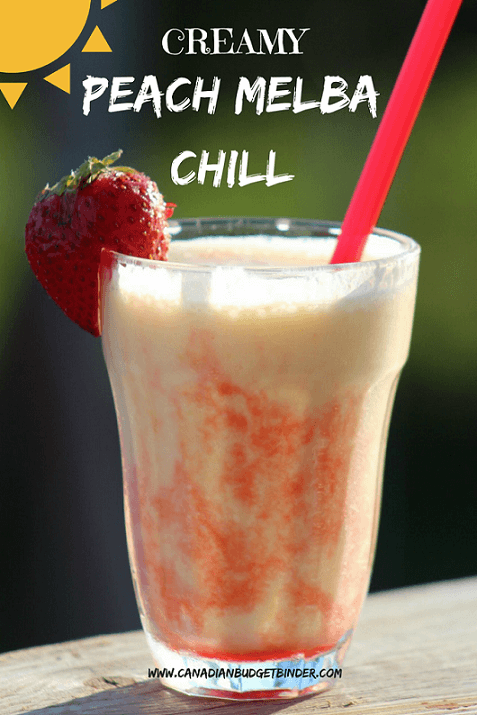 What a better way to enjoy a non-alcoholic frozen drink on a hot day then with this super frosty Peach Melba Chill. If you’re craving a budget-buster popular Chocolate Ice Chill from Tim Hortons you don’t need to drive anywhere at all to pick up one of those drinks. As long as you have fresh ingredients stocked in your pantry and refrigerator you can make frosty blender drinks all summer long. Best of all, it’s done in your kitchen or even outdoors if you are lucky to have a bar or space to create a bar station. With just a handful of ingredients you can whizz this Peach Melba Chill up in 5 minutes. I hear you shouting, No way. Yes Way! I’d rather be spending my time sitting outside sipping on a frosty beverage in front of the pool even if it is a kiddie pool. You will be the envy of your neighbours and party host of the summer. Our family loves peaches and when they are in-season you can skip the canned peaches and go right for the fresh Ontario peaches. Alternatively if you can pick up frozen peaches for a great deal then they work just as well. You may have to adjust the ice-factor since they will already be frozen. Be your own bartender and save yourself some money by skipping convenience for homemade delight. It takes no time at all and the ingredients are available all year-long at every grocery store. The Peach Melba (French: pêche Melba is a dessert of peaches and raspberry sauce with vanilla ice cream. The dish was invented in 1892 or 1893 by the French chef Auguste Escoffier at the Savoy Hotel, London, to honour the Australian soprano Nellie Melba. 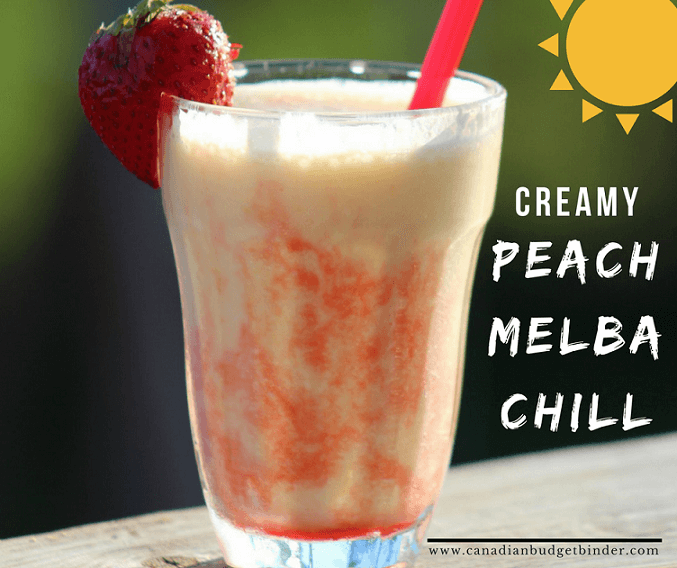 When I was trying to come up with peach drink names the Tim Hortons Chill came to mind and that is how I came up with the Creamy Peach Melba Chill. I obviously don’t have their secret recipe however I was able to create something just as delicious and healthier for you as it’s packed with fruit. I’ve mirrored the Tim Hortons Creamy Chocolate Chill the best I could but switched it up for fruit. I’m Queen of the peaches in our household after creating this Peach Melba Chill. What ingredients go into a Peach Melba Chill? The Peach Melba chill is made with peaches, ice-cubes, 18% cream and a strawberry sauce. You can add sugar if you like to sweeten it up or use the natural flavours of the peaches. The strawberry sauce is optional however it’s traditional with peach melba to have a fruit sauce. Do I need to use cream? Adding cream is ideal however if you’d like to try Milk, Soy Milk, Almond Milk, Cashew Milk, Coconut Milk or Half and Half cream you could certainly do that. Keep in mind the texture, thickness and consistency will differ but just as delicious. Using frosty mugs or by freezing a mug first before pouring the Peach Melba Chill inside you will feel like you’re soaking up the rays on a resort on holiday. Close your eyes first and savour the flavours of this gorgeous colourful frozen peach drink that your friends will beg you for the recipe. If you love peaches you will struggle to put this delicious frosty summer beverage down. Beware for brain freeze and lots of flavour explosion in your mouth. My parents were over from Scotland last summer and couldn’t get enough of these cold drinks as they experienced our humid temps. Now you can simply share the link to my award-winning (My family and friends love it) recipe and ta-da your friends can be their own bartender. Can you juice a peach? Let’s simplify this by saying to just puree it until it resembles peach soup and then work with it from there. You can add water to the thick puree to thin it down and use as a peach fruit beverage or add it to your favourite peach drinks. Peach Melba Chill is so easy to make that you won’t hesitate to serve it at your next frugal backyard BBQ. Even the kids will love it! This creamy Peach Melba Chill is the perfect frosty drink to serve your guests this summer out on the deck. It's easy and inexpensive. Boil washed and cut strawberries 1 pint with ⅓ cup of sugar, ½ cup of water and lemon juice. Simmer until reduced to a chunky sauce. Use chunky or whizz up with a hand blender. This is also perfect for topping on ice-cream, waffles, crepes, pancakes. Adjust sugar as preferred. Stores for up to a week in the refrigerator or freeze it. In a blender place all of the ingredients and whizz them up until smooth. You may have to shake it up a bit to get those last few pieces but it doesn't really matter if you don't get them all! Using a tall glass or mug lightly coat the inside with strawberry sauce. Slightly slice a larger strawberry to rim the glass with before serving with a straw. Pocket the $5-7 or more that you would be dishing out at Tim Hortons, Starbucks or any other shop that sells frosty drinks this summer. It’s amazing how the little expenses can really add up. Besides, everything tastes better when it’s homemade with fresh ingredients. Discussion Question: What is your favourite cold blender drink? Enter your email address on the home page to SUBSCRIBE to my blog. Once you subscribe you will receive an email from me immediately which you need to open and approve the subscription in order to start receiving my daily blog post. Lol. So easy to make up your own especially with the blender! I have a juicer too which is great to make these! This does sound yummy!!! I might fudge this one if I can get a good deal on peaches, fresh or frozen……I’ll be picking strawberries shortly and thinking I might make a batch or two of reduced sugar freezer jam with some. I have Mom’s blender here….thinking the peaches, freezer jam and vanilla ice cream for a quick and easy treat. I remember Mom making us milk shakes in it, chocolate sauce, ice cream and a little milk to help the blender with the hard ice cream. Getting ideas floating around in my head now!! Thanks Nicola!!! !